For some reason, every time the holidays come around, I start to get really into weekend brunch. Maybe it’s because all of those yummy smells first thing in the morning is exactly what I need on a gloomy winter day. Or it might be because it’s fun to use all of those classic fall spices – cinnamon, nutmeg, ginger – in brunch recipes. 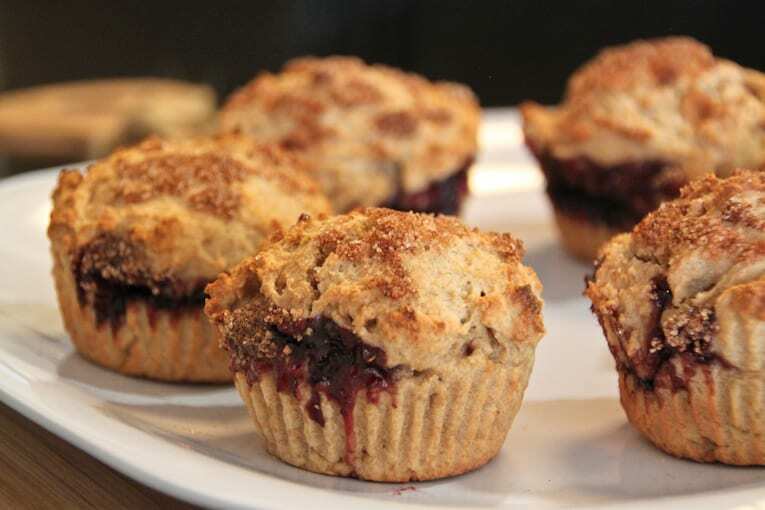 Whatever the reason, these delicious, hearty muffins have been a star at my brunch table recently. I originally created it as a recipe makeover for Women’s Health, and now I’m excited to share it with all of you! 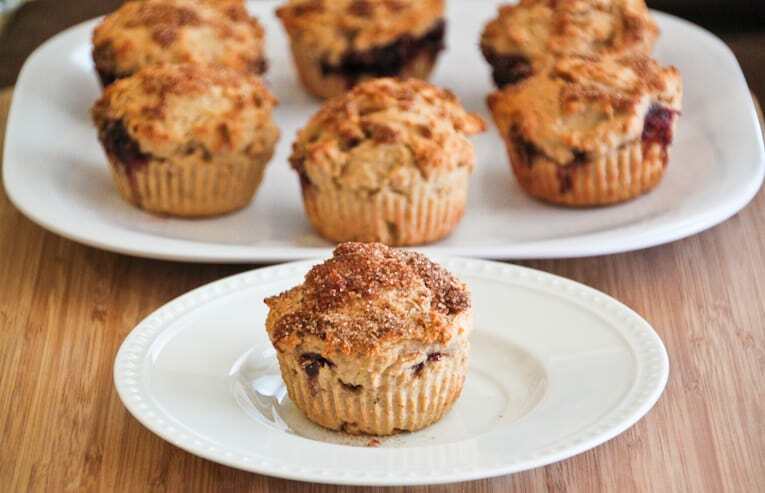 These muffins are packed with nutritional goodness and secret swaps: whole wheat flour, applesauce, egg whites, and low fat buttermilk – but you won’t be able to tell at all! 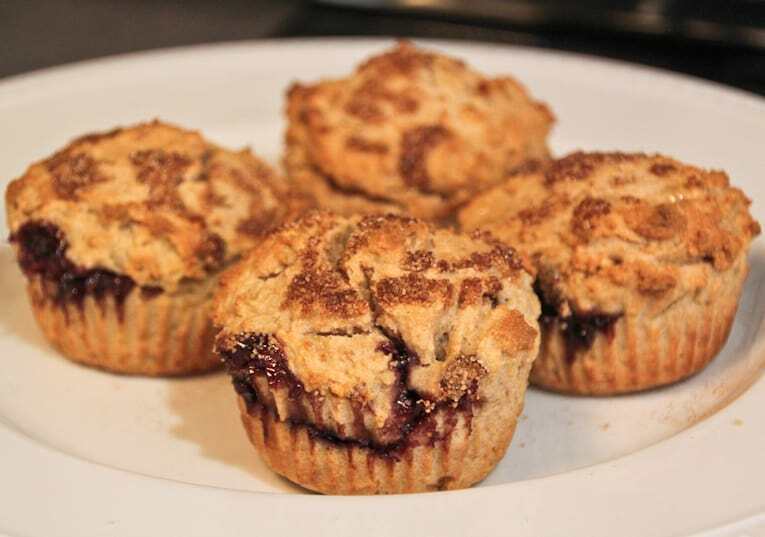 The gooey raspberry preserves ooze out of each muffin when you bite into it, and the cinnamon sugar topping adds an element of decadence without any of the extra calories or fat. They take about an hour to make (including baking time) – but it is so, so worth it. Step 1: Preheat the oven to 425°F. Lightly grease a standard muffin tin or line with 12 muffin cups. 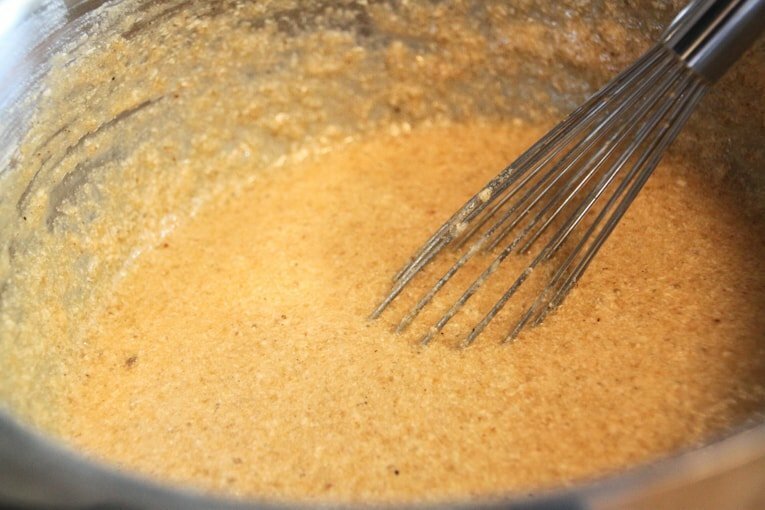 Step 2: In a mixing bowl, cream together the butter, apple sauce, and sugars with a hand mixer until smooth. Then add the eggs, egg whites, and vanilla, beating to combine. 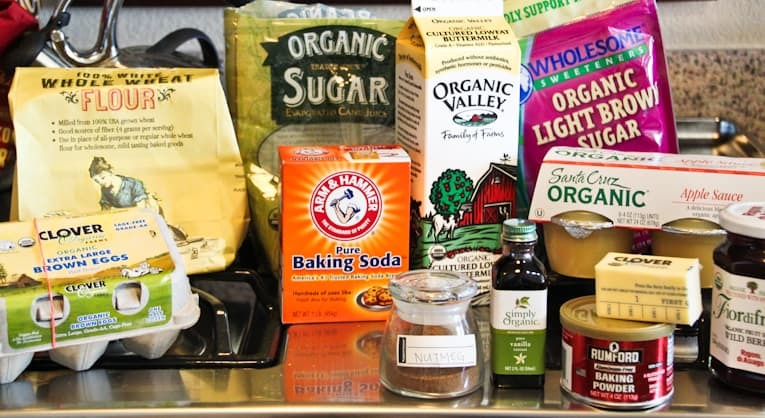 Step 3: In a separate bowl, stir together the flour, baking powder, baking soda, nutmeg, and salt. Step 4: Stir about one-third of the flour mixture into the butter mixture until incorporated, then stir about one half of the butttermilk into the butter mixture. Step 5: Continue alternating between the two until you’ve mixed in all of the flour mixture and buttermilk (so you begin and end with the flour mixture). Step 6: Spoon about 2 Tbsp of the batter into each cup of the prepared pan. Then put about 1 tsp of raspberry preserves in the middle of each cup, and top each with another 2 Tbsp of batter (by the end of this process, the cups should be nearly full). Step 7: Bake the muffins for 14-17 minutes, or until they’re a pale golden brown and a toothpick inserted into the middle of one of the muffins comes out without any unbaked dough on it. Remove pan from the oven, and let muffins cool for a couple of minutes, or until you can handle them. 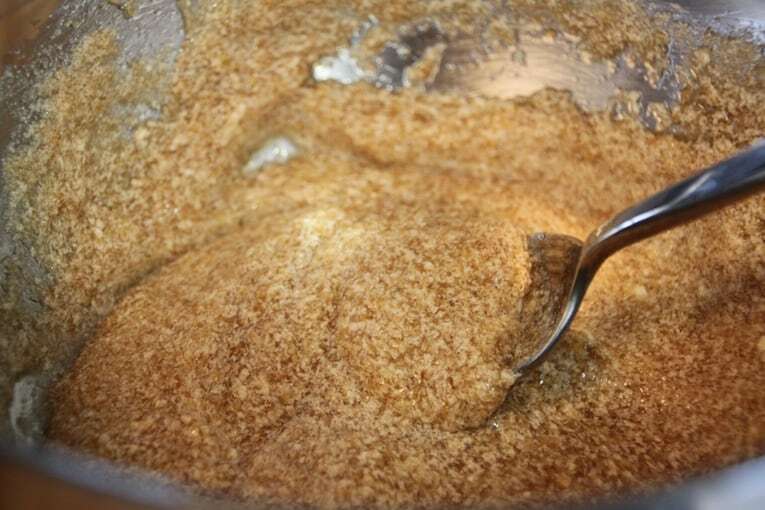 Step 8: While they’re cooling, melt the butter for the topping in the microwave and mix together the cinnamon and sugar. 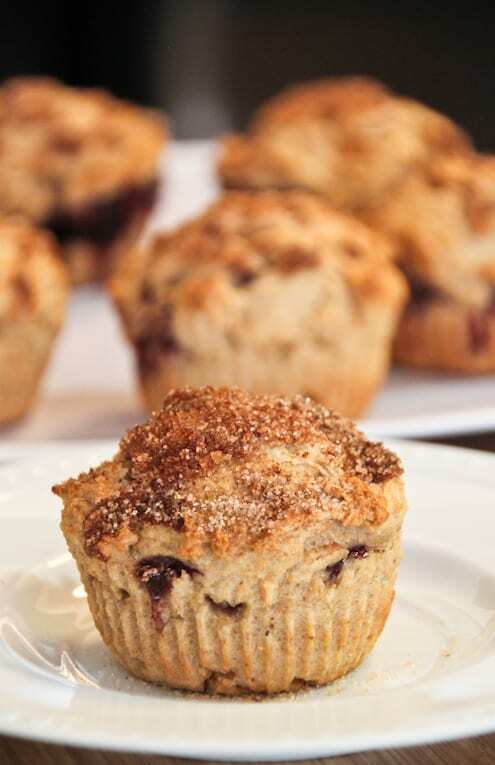 Use a pastry brush to spread the top of each muffin with the melted butter, then sprinkle with the cinnamon-sugar mixture on top, using 1/2 tsp per muffin max. 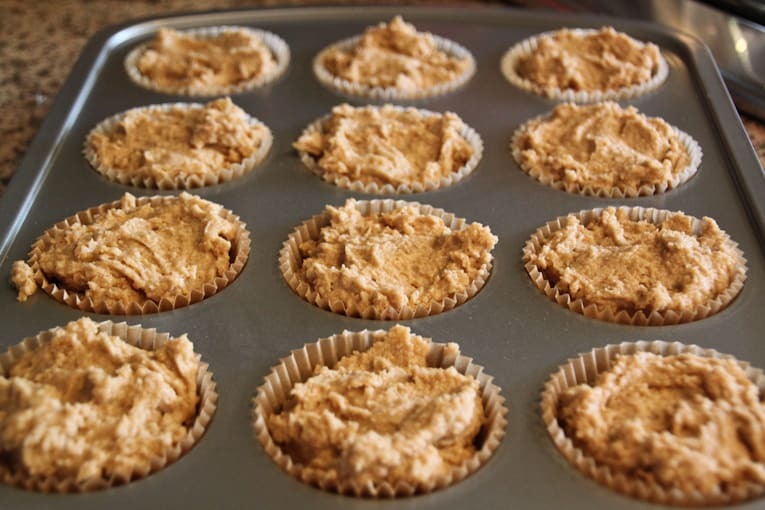 This recipe makes 12 muffins, but each one ends up being a pretty big size, so you could also use this recipe to make mini-muffins which would make each less than 100 calories. Just cut your cooking time in half if you decide to do this! 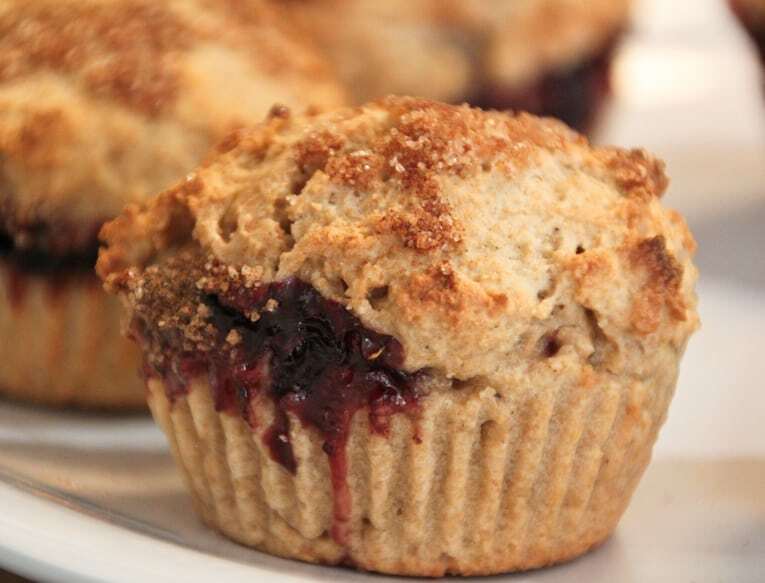 The cinnamon sugar crumble on top was the husband’s favorite part of the muffin because it forms this perfect little crust that adds great texture to the recipe. It’s great as a grab-and-go breakfast option with a glass of milk, or as part of a bigger brunch spread. They last for at least a week in an airtight container so you can enjoy them for a while. So go ahead, treat yourself! These muffins are packed with nutritional goodness and secret swaps but you won’t be able to tell at all! Raspberry jam and cinnamon sugar add decadence. Preheat the oven to 425°F. Lightly grease a standard muffin tin or line with 12 muffin cups. 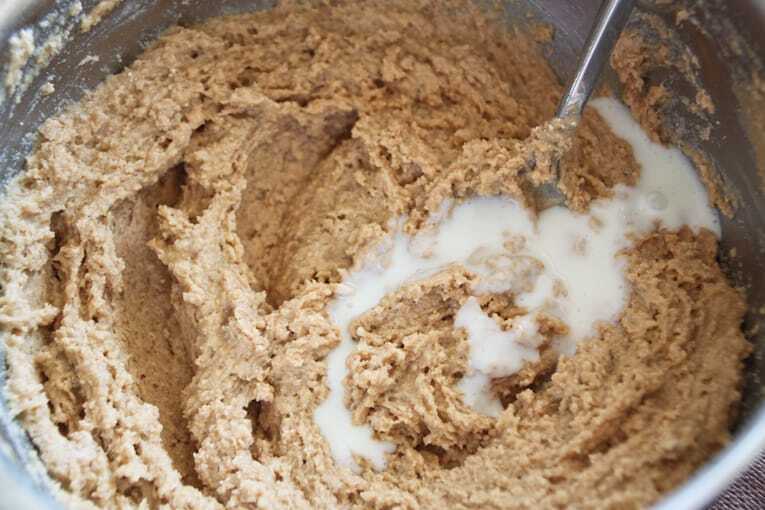 In a mixing bowl, cream together the butter, apple sauce, and sugars with a hand mixer until smooth. Then add the eggs, egg whites, and vanilla, beating to combine. 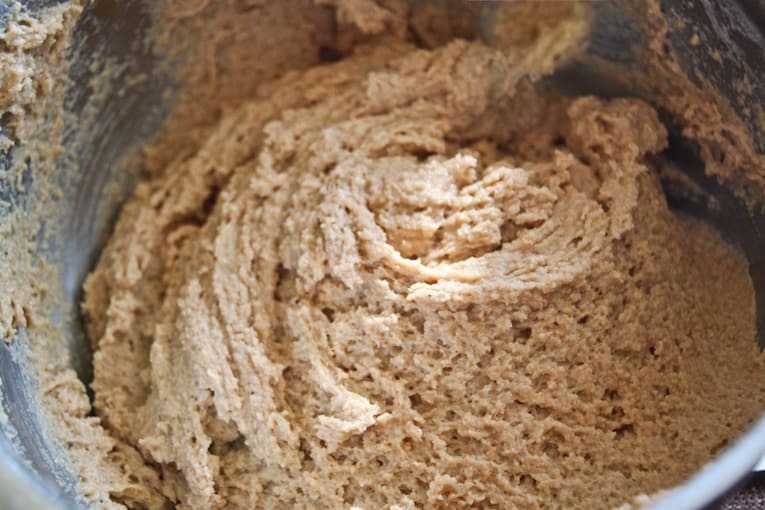 In a separate bowl, stir together the flour, baking powder, baking soda, nutmeg, and salt. Stir about one-third of the flour mixture into the butter mixture until incorporated, then stir about one half of the butttermilk into the butter mixture. Continue alternating between the two until you've mixed in all of the flour mixture and buttermilk (so you begin and end with the flour mixture). Spoon about 2 Tbsp of the batter into each cup of the prepared pan. Then put about 1 tsp of raspberry preserves in the middle of each cup, and top each with another 2 Tbsp of batter (by the end of this process, the cups should be nearly full). 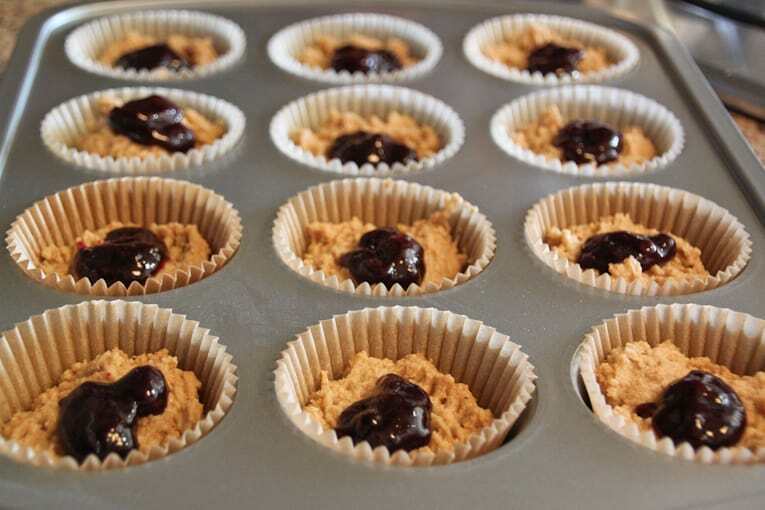 Bake the muffins for 14-17 minutes, or until they're a pale golden brown and a toothpick inserted into the middle of one of the muffins comes out without any unbaked dough on it. 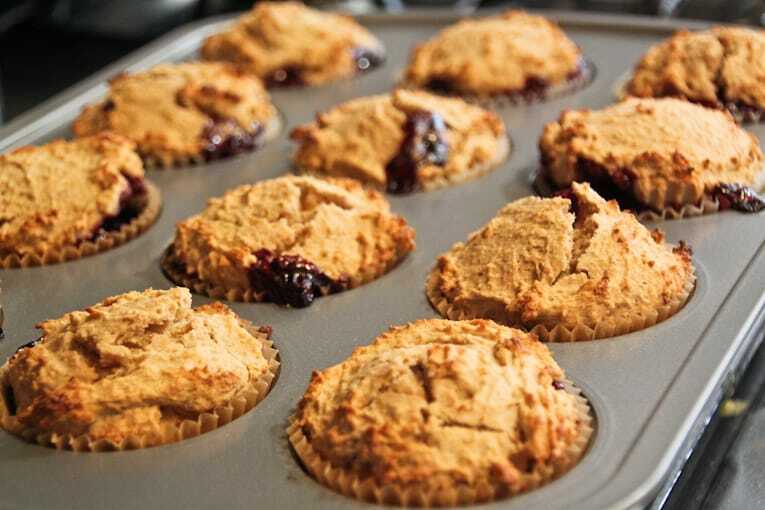 Remove pan from the oven, and let muffins cool for a couple of minutes, or until you can handle them. While they're cooling, melt the butter for the topping in the microwave and mix together the cinnamon and sugar. Use a pastry brush to spread the top of each muffin with the melted butter, then sprinkle with the cinnamon-sugar mixture on top, using 1/2 tsp per muffin max. I cannot wait to try these! trying your kale butternut quesadillas tonight…. dang i just went to trader joes, wish i saw this post earlier haha! Thanks for posting such awesomeness! Ooooh yay!! The quesadillas are delish – I can’t wait for you to try them 🙂 Let me know if you get a chance to make this too! They are so worth it! I’m definitely having these for brunch the next weekend! They look so tempting! And by the way, I made your cinnamon rolls the other day, and they came out beautifully- tasted great too! Thanks for the recipes! Awesome!! I can’t wait to hear how you like this recipe Olivia 🙂 And I’m so glad the cinnamon rolls turned out well! They are one of my favorites! Oh my gosh these muffins totally got me drooling!! Thanks Kammie!! You have to try them – I’m sure you’ll love them!